Marsupial Cuteness Overload at @LowryParkZoo!!! Hey guys! Jerm here with a "Cuteness Overload" update from our friends over at Tampa&apos;s Lowry Park Zoo! 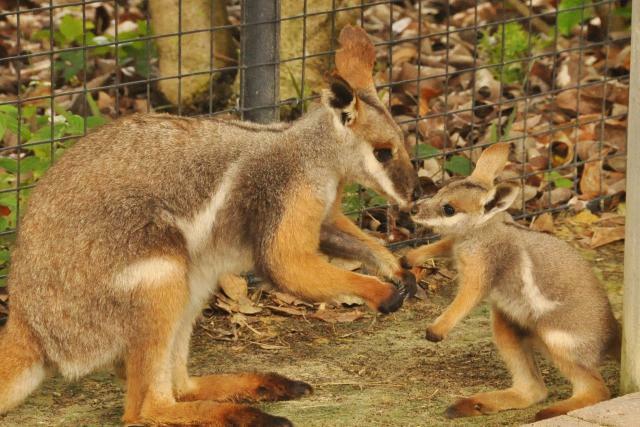 A trio of female yellow-footed rock wallabies have become first time mothers at Tampa’s Lowry Park Zoo, just in time for Mother’s Day. The marsupial moms – known as Mum, Daisy and Thumper – arrived at the Zoo last year and have conceived three female joeys in various stages of development. In March, zookeepers observed visible movement in all three mothers’ pouches. The oldest joey has now fully emerged, the second can be seen peeking out of mom’s pouch, and the third is active in the pouch and is expected to make an appearance soon. The three joeys were discovered in November, December and January. When a joey is first born, it is only about half an inch long, blind and bald. The newborn grabs onto its mother’s fur and pulls its way into the pouch. Joeys remain in the protective pouch for the first six to seven months where they continue to grow and gain strength. 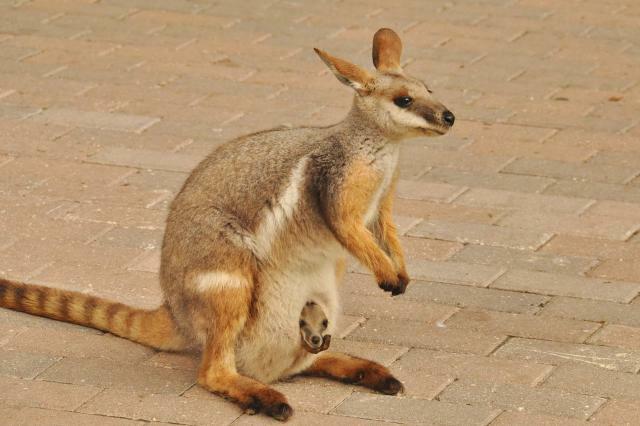 At about eight to nine months, the joey will become too large to remain in the pouch but will remain close to its mother. During this stage the young is called a "joey at heel." Yellow-footed rock wallabies are native to South Australia, Western New South Wales and Southwestern Queensland where they live in rocky terrain, as their name implies. The rock wallaby can jump vertically about twice its own height, aided by its large feet and rubber-band-like leg tendons. Wallabies feed off of grass, leaves, hay, bark, twigs, and fruits and vegetables. They are some of the most colorful marsupials (pouched animals) with distinct yellow/orange feet and striped tails. For an up-close encounter with a wallaby mob (group), take a walkabout in their walk-through exhibit in Wallaroo Station. Pretty awesome huh! That&apos;s all for now, but stay tuned in for more updates on Tampa Florida attractions and things to do in Tampa Bay!